Catherine, Duchess of Cambridge, departs the hospital with her son wearing diamond and pearl earrings from the Queen’s collection. Like just about everyone else, I overlooked the fact that the pearl earrings Kate Middleton wore on Monday when she introduced Prince Louis Arthur Charles to the press were diamond and pearl earrings from the Queen’s collection. Let me rephrase that statement. I noticed she was wearing pearl earrings, but I just glanced at the jewels and assumed they were one of her contemporary classics from Anouska or Kiki McDonough. In addition to the fact that I was far more focused on the cool jewelry Meghan had worn over the weekend and didn’t really study Kate’s designs. I don’t know who first woke up to the reality of Kate’s jewels, but the news ignited the internet yesterday. Four days after the fact someone finally noticed, the earrings came from Queen Elizabeth’s jewelry box! Every single story I read said the jewels were a nod to the monarch and the red dress was a hat tip to Princess Diana who wore a red dress when she gave birth to Prince Harry in 1984. I am not sure about the dress. Let’s just say I don’t disagree. Symbolism in clothing seems to be a trend with public figures. When it comes to the jewelry, however, I have a far more expanded view of the situation. Catherine, Duchess of Cambridge and Queen Elizabeth II who is wearing Queen Mary’s Button Earrings in 2012. I believe Kate has had a royal jewelry makeover. Why you ask? Let’s briefly recap. In 2016 when Kate, William and the children took an official trip to Canada on one formal occasion she mixed a diamond maple leaf brooch that once belonged to the Queen Mother with (gasp) demi-fine pearl and Swarovski crystal earrings from Soru that cost around $180. In short, I don’t think I am the only one that noticed the incongruous combo. 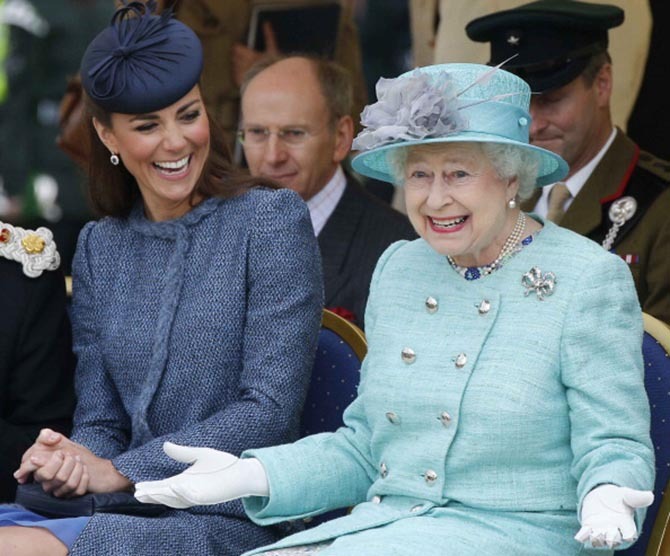 Ever since that moment, we have seen Kate dive more frequently into the royal jewelry box of the Queen. It’s a deep pool of jewels that Diana used to swim around in with great style and ease. 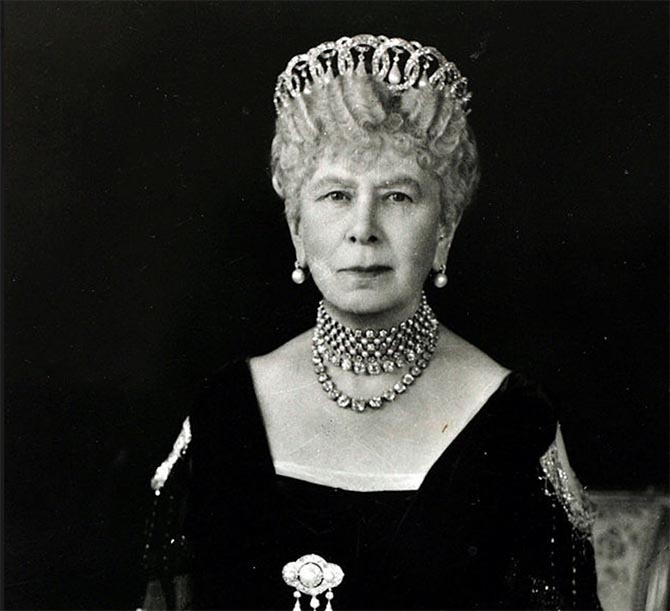 Queen Mary wearing her Button Earrings around 1930 along with several other jewels. To be absolutely clear, the jewels are not just accessories or fashion statements. They are vehicles that carry the history of the British Royal Family. 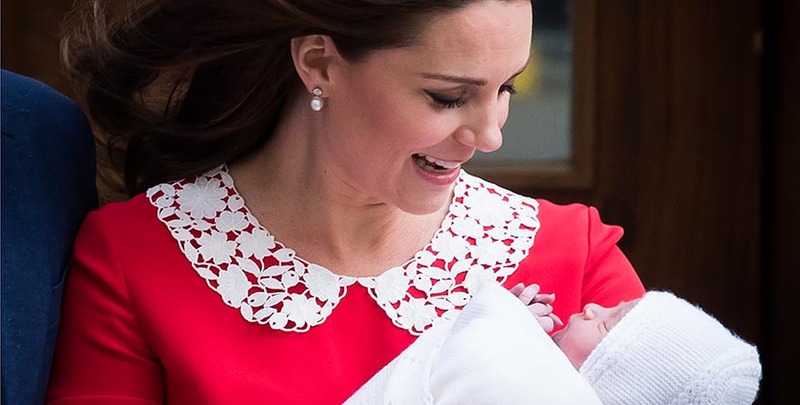 People believe Kate wore the Queen’s earrings at the hospital to acknowledge her and the fact that the new Prince almost shared a birthday with the monarch. According to royal jewelry blogger Anna Kay of The Court Jeweller the provenance of the earrings is unknown. The style of the designs is very similar to Queen Mary’s Button Earrings which is a slightly confusing title for the jewels because they are actually a diamond stud with a pearl beneath it. The jewels were given to Queen Marry in 1893. Based on the date, I think it’s safe to say they are natural pearls (they predate the invention of cultured pearl farming) which means they are Important with a capital “I.” According to Leslie Field author of The Queen’s Jewels, the pieces were a wedding present along with a pearl necklace paid for with money raised by 650 ‘Ladies of England and Devonshire.’ In a thank you letter to the chair of the fund drive for the jewels, Queen Mary wrote “I shall always value their presents for me and mine, and ever remember their great kindness.” Queen Mary gave the jewels to Queen Elizabeth as a wedding present in 1947. While the jewels may not be the same pair the Queen has indefinitely loaned to Kate, Queen Mary’s sentiment reflects how jewelry is a part of representing the royal family. The main reason I believe Kate has upped her jewelry game and started to appear in important pieces more routinely is because I think she has gained a deeper understanding of the history of the royal family. The jewels are like a thread line through the generations. Wearing Queen Elizabeth’s earrings on the day her third child was born, not only acknowledged the monarch’s birthday, it was a celebration of the royal family and England.